Ms. Liz is stunning and humorous. Surely she will make it big! She really does deserve poetry! Haha, Liz is quite fashionable. Love her red toenails. Liz, the lizard, is an adorable creature, not very pretty, but she has character. Your creativity is truly astounding, Jodi. Adorable! I love Liz and her pearl necklace! Haha! I imagine it was fun! She is a fun lizard! So adorable Jodi!! I love the pearls and nail polish Ms Liz! no I didn’t how cute!! What a cool lizard! Great job! LOL!! Of course you can 🙂 Happy Christmas Wishes to you in New Zealand! (Lucky YOU! One day I will get there!) Have you ever been to the U.S? Thank you Jodi! Within the last 10 yrs or so we did two trips to the UK and stopped over for three nights, both ways, in LA. We arranged our own accommodation in residential areas. We had such a wonderful time, exploring all over the place (doing lots of walking). We were blown away by everything we saw and experienced, it was truly amazing and wonderful (except the airport with officious, bossy staff). Long time ago, Nigel spent 3 months cycling in Alaska! Hey Jodi, I’m going to try using Ms. Liz for the name on my profile. Now I have two blogs I need to change to a name that works for both! Hope you don’t mind me appropriating the name? your smiles make me smile 🙂 Thanks Christine! Jodi, I’m visioning the start of a new book. How cute Ms Liz is! She may need some more glamour Accessories in the future. Bet you made “Gama” little grandson happy, even if she is a girl. She is going to need some other playmates in the future. Oh My! I’m sure they will enjoy them very much! I can’t wait until my grandson is old enough for me to read Klaus the Mouse to him. (Right now, he tends to chew on his books so he can’t have the paper ones yet.) You do wonderful critters! Benjamin says : “Namaste, My Jodi!” while in the proper posture…too cute! He has been greeting me with this each morning and upon leaving each afternoon, he has taken this very seriously. 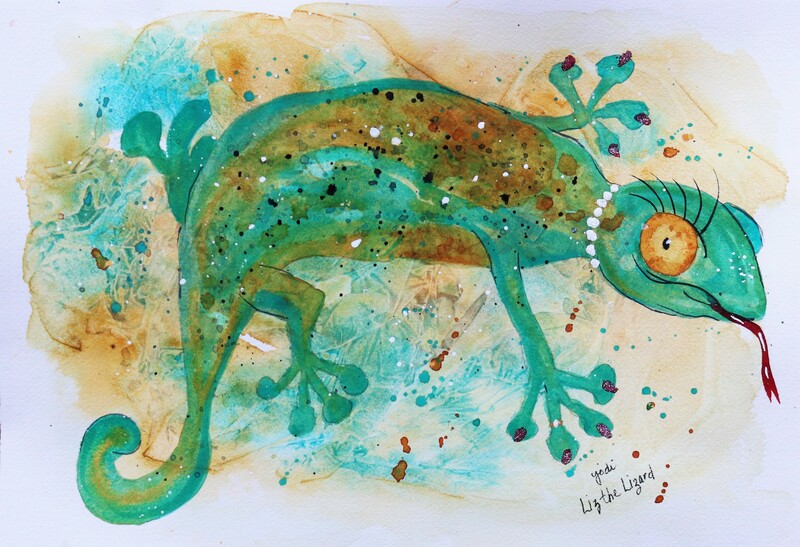 On the divine Liz the Lizard, Benjamin says : “Liz is a classy lady lizard and beautiful too! Two thumbs up for My Jodi!” I asked him what does he think classy means, he said : “Classy means just like Mommy.” High praise indeed! Thank-you x 2!! Where has Benjamin learned this sweet greeting? 🙂 Thank you sweet buddy! Namaste, My Benjamin! YOU are a classy young man 🙂 Just like your Mommy! And your Gem! Love to you both!